Smooth Ambler are a West Virginian distillery, set up in 2009. As is often the way with young distilleries, they produce a range of vodka and gins, but it’s their whiskey that is the focus of my attention today. 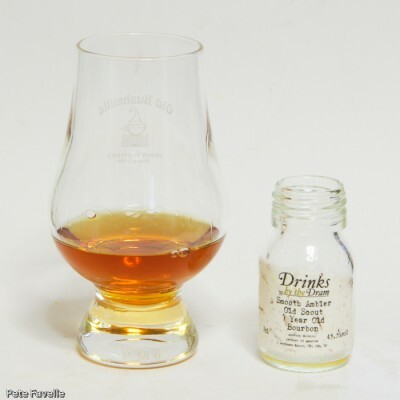 The folk at Master of Malt have an interesting Smooth Ambler taster set which covers both gins and whiskies, which will definitely be going onto my birthday list! Old Scout Straight Bourbon is a 7 year old bourbon with a relatively high 36% rye content – not every bourbon producer gives you exact figures, but anything over 30% rye is noteworthy. Having tasted a fair amount of rye whiskey when we were in the US last year, it’s certainly something I intend to explore further. The aroma is full of soft toffee with crystalised ginger and a touch of dried apple. Water knocks back the sweetness, exposing more dried apple along with poached pears and vanilla. In the mouth, it’s delicious; spiced vanilla fudge with a slowly building chili pepper kick. The finish is impressively long, with hints of pipe tobacco and just a little sour cherry. Watered, it’s not substantially changed – the sweetness is more subtle and the heat takes longer to build, stretching the finish even further. There’s a wonderful smoothness to it, and it lacks the harsh grain alcohol edge that you can sometimes find in bourbons. Overall, I’m loving this and will definitely be trying the rest of their range. 4.5 stars.